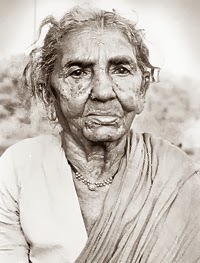 Chityala Ailamma was a participant in the Telangana peasant armed struggle. She revolted against the feudal landlord Visunoori Ramchandra Reddy to protect her 4 acres of land, which she had leased from another landlord. Chityala Ailamma (1919-1985) was a participant in the Telangana peasant armed struggle. She revolted against the feudal landlord Visunoori Ramchandra Reddy to protect her 4 acres of land, which she had leased from another landlord. The landlord wanted to take the entire produce. She approached the Sangam leaders.Andhra Maha Sabha was also called as sangham by the common people. Under Sangam leadership, 50 comrades came cut and thrush the paddy crop the following day. The landlord’s goondas could do nothing. This incident inspired the entire Telangana region, and people joined the Sangam to protect their crops. Ultimately this revolt turned into armed peasant struggle from 1946 to 1951. Ailamma joined the Andhra Mahasabha and Communist party and her home became the centre of struggle against landlords. She married Narsaiah and had four sons and one daughter.